Blessed Plow Monday everyone! Now that midwinter has passed and the light has started growing, my mind is turning toward the coming of spring and this years garden. We’ve a ton of seeds (mostly nightshades and daturas and fragrant woodland tobacco) that we’re going to start soon, so I’m checking the lunar calendar. Planting by the signs of the moon is one of those old mountain customs still practiced by some individuals in Appalachia and the Ozarks. Many years ago when I was learning about it, I asked my grandparents if they planted by the signs. They said they just planted when the weather was right, but they knew plenty of old people who did. My grandfather told me it was attested in the bible, right in the beginning of Genesis: “And God said, Let there be lights in the firmament of the heaven to divide the day from the night; and let them be for signs, and for seasons, and for days, and years.” This rural lore was widely practiced in regard to both planting and harvesting. 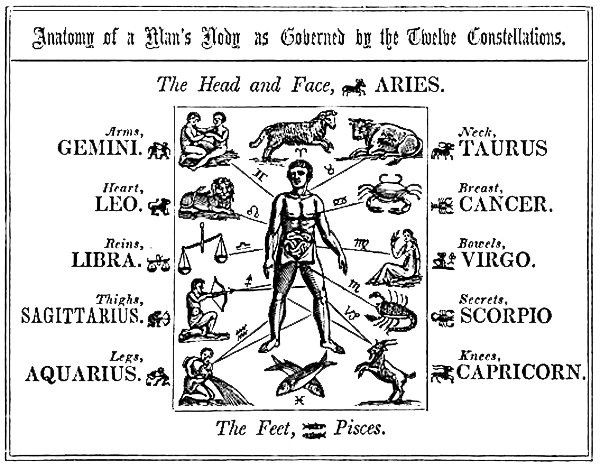 The basics are that, in addition to their traditional elemental association, each of the signs of the zodiac are described as fruitful or barren, and moist, watery, dry, earthy, fiery, hot, or airy. Planting is always done in one of the fruitful signs, and in general the best signs for planting are the water or earth signs. Planting should not be done in one of the barren signs; they are only good for pruning, killing, and weeding. The fertile water signs are Cancer, Pisces, and Scorpio and are best for most plants. Taurus is also moist and productive and good for planting, especially plants grown for their roots. Libra, though an air sign, is a moist, fruitful sign and good for flowers. Lastly, Capricorn is fertile but dry, so while not ideal, may be good for certain root crops and careful planting. The signs are traditionally assigned to parts of the human body. You’ll most often hear them discussed this way in Appalachia: “The signs are in the feet today, I’m gonna plant my blue lakes, so that they’ll start running.” [Pisces is productive and moist and good for irrigation and root growth] and “Never transplant in the head or the heart, you’ll kill your plants.” [Aries and Leo are both barren, dry signs].